Heuchera are tough perennials in compact and rounding shapes that make excellent border plants. These hardy herbaceous plants are versatile in nature and are tough enough to tolerate heat, cold, humidity or drought. Their foliage shape and colours are most impressive and in addition to all, these are easy to grow plants that need low maintenance. Every bit of these plants is perfectly tuned by nature. Paprika is a stunning warm coloured variety of Heuchera that is sure to brighten up your garden in all seasons. It features large maple-like, orange coloured lobed leaves with hints of pink, that adorn the plant throughout the year. The leaves display striking distinct white veins that turn copper-burgundy as they mature. In spring, small white bell-shaped flowers appear in panicles on tall stems. 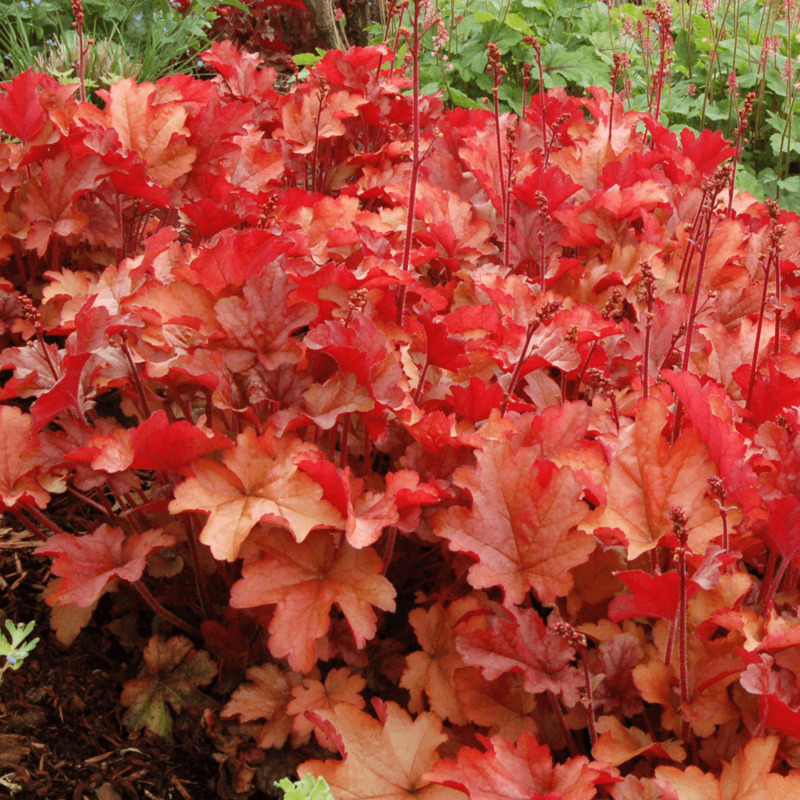 Heuchera Paprika, also known as Coral Bell Paprika, can withstand extreme drought and winter. It will thrive in any soil that is moist and well-drained. Plant them in sheltered or exposed location in full sunlight where its foliage colours will dazzle in the light. It prefers shady areas though, which is, in fact, perfect to make any dull corners perky. Avoid over-watering the plant and make sure the crown of the plant is not buried in the ground. The only annual upkeep Heuchera will ever demand is the removal of any faded leaves in spring. Heuchera Paprika makes a great accent plant. It is perfect for shady areas in the front of the border or in rock gardens. Its tidy mounding habit makes it perfect for garden containers. Use it to decorate mixed borders, beds and decorative ground cover under other taller shrubs.